This homegrown discounter once had a smiling mascot named "Buckworth." Below is from a 1971 advertisement, listing all the cities where Bargain Town then had stores. The chain extended from Columbia, Tenn., all the way down to Troy. Bargain Town USA #7 in North Birmingham, March 1960. 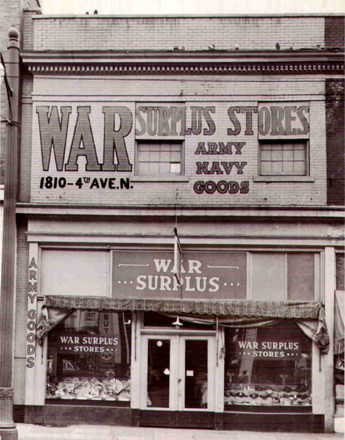 The early stores were showplaces of giant mural-like signage! Another early location ... I'm not sure where this is, but I suspect it's somewhere in downtown Birmingham. It has the diagonal stripe motif seen on the North B'ham store above, but the Not-Buckworth-Yet painted on this sign looks far more excited (amazing what the eyebrows'll do!). This is closest to how the little man would be pictured later in the '60s, when a consistent "look" emerged. From the earliest head-and-pointing-finger incarnations -- with its many subtle differences among the different sign painters -- to the full-body "elf" style beginning in the late 1960s -- to the Bicentennial-era "Uncle Sam" look, where Bucky sports a full head of blond hair. Buckworth would retain this form in most advertising until he was retired in the early 1980s. The county seat of Walker County (native stomping grounds of my mother's family) got their own BT store, and the line stretched outside the store this hot Summer day in 1963. It seems that Bargain Town enlisted different sign painters for many of the early stores, hence the different interpretations of the Face With No Name. Here he looks downright mean! "If you like bargains, you'll love Bargain Town ... OR ELSE!!!" One of The City's Finest directs traffic around this crowd of people waiting to partake of bargains at their new BT store. The Man Yet To Be Named Buckworth greets Marshall Countians with a giddy face. Whomever painted this one evidently was influenced by Don Martin, who used to be a cartoonist for Mad magazine. Inside a Bargain Town store, circa mid to late 1960s. Like Albertville above, this rendition of our smilin' hero is straight from the 'Mouth' period. Stenciled on the wastebasket out front is "KEEP LEEDS CLEAN." The exterior was painted by Hodges Signs, and dated June 1, 1965. A happy family emerges with bargains in hand. The painters didn't let the limitations of a landlocked downtown storefront stop 'em. Going from the gold-on-navy color scheme on the car tags, this would have to be from the 1966 to 1967 period. By now, when this BT store opened in the Lee County city of Opelika, the Corenblums and Barsteins had moved to a more standardized signage -- and here we see our smiling mascot now donning a full body. Probably one of the last of the painted facades; most stores opened in the 1970s had the attached signage as pictured on the Opelika store above. It sports the full-body Buck', and the banner sports the template that would be used for future stores. OCTOBER 1968: HE GETS A NAME! Bargain Town USA held a contest for what was then termed "the Bargain Town man" -- name him, and win a $4,000 college scholarship. The winning entry was submitted by Bessemer resident Mrs. Don Wallace. At right is a news clipping where daughter Kimberly is presented with her scholarship check. Goodbye Miller ... Hello Buckworth! A sign crew is shown putting up backlit BARGAIN TOWN USA signs below the main Westgate Shopping Center sign. Bargain Town opened a store here in 1975, replacing the dying Miller's Discount Store chain. If you like Easter, you'll love Bargain Town ... hop-hop-hop! I don't have to tell you that this ad circular dates back to some time in the mid 1970s. I mean, just look at that boy's suit ... good gravy! This is from a time when I was close to the age of the kids illustrated here. Talk about a bad flashback; why did '70s fashion designers drink that Kool-Aid, anyhow??!! "Your Money's Worth Or Your Money Back"
Plenty of smiling cashiers stand ready to take your dinero for the bargains overflowing your shopping cart. So ... didja get a star? 1981 grand opening for yet another BT store (location unknown). Wascally Wabbit is on the balloons. Uh oh, is that Buckworth who shaved his head bald and has traded his Uncle Sam garb for a hunting coat ... and gun? ....if you wike bargains you'll wuve Bargain Town, Huh-uhuhuhuhuhuh!! Mr. Mervyn Barstein is pictured with a life-sized Buckworth in honor of Bargain Town's 25th anniversary in 1982. Buckworth would ride into the sunset soon after this milestone. One of many jingles produced over the years at Boutwell Studios in Birmingham.